It’s a known fact that young children, particularly little tots, learn by doing. Does playing with realistic baby dolls that cry and poop makes sense? Yes they do. Playing with these living baby dolls is one of the most noteworthy “pretend play” that allows them to explore their capacity as a nurturing individual. This gives them a sense of responsibility, and in a way, stimulates socio-emotional development while honing their fine motor and coordination skills. When thinking of buying lifelike baby dolls, these realistic baby doll options come highly recommended. this baby doll that cries. 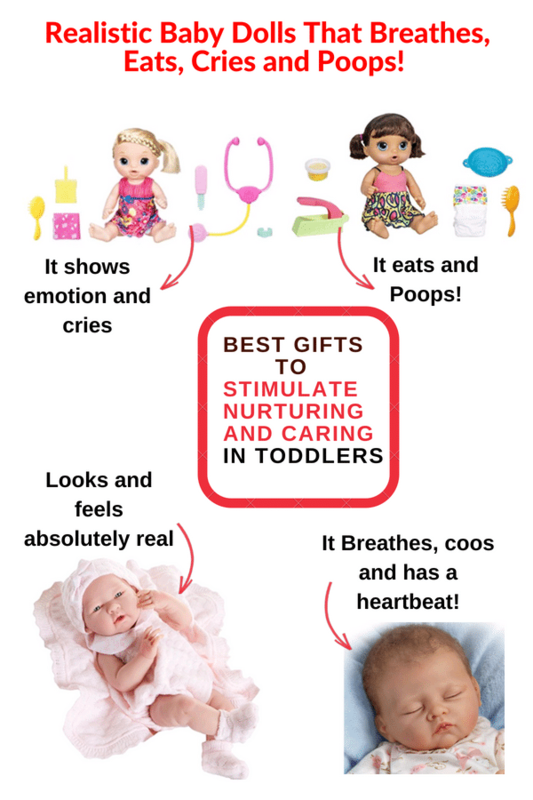 Tap on your child’s nurturing skills and emotional development with the Baby Alive Sweet Tears Baby Doll. This lifelike doll can show emotion and cry tears with the nose lighting up red when feeling sad or emotional which signals for tissue time! A perfect companion for toddlers age 3 and up, it helps to expand their vocabulary skills with more than 35 phrases and sounds in both English and Spanish. The doll comes with a stethoscope, thermometer, bandage, tissue and brush. It also drinks straight from a juice box and needs care when sick. What a way to teach nurturing skills to young tots! Realistic Baby Doll that Poops. Another realistic doll that stimulates nurturing skills in a growing child, the Baby Alive Super Snacks Snackin’ Noodles Baby Doll is a keeper. It allows one to make “noodles” and feed it to the baby doll. He or she can feed the doll, lull it to sleep, and change diapers when it poops. Yes, it poops! This gives toddlers a sense of nurturing and, in way, helps them to be aware of the needs of others. This brunette realistic baby doll can also make 20 fun sounds and phrases in both English and Spanish. This is truly oodles of fun! Yes this lifelike doll poops! Check out all other things it do. Want to “adopt” a lifelike baby? Then, this LifeLike Baby Dolls For Girls will definitely be an excellent choice. A child can be taught to feed the baby with porridge via a plate and spoon then, let it drink from its own bottle. It can also wet the nappy and go potty. This doll also helps stimulate a child to look forward with bathing time as it can spend time in water. When it cries, a pacifier can be smacked on its pouting lips to lull it to sleep. For every purchase, a birth certificate and a friendship bracelets for the doll and the owner are included. How cute is that! This newborn real like bay doll in Pink Knit Set is truly mesmerizing. This baby Doll is designed to be lifelike with anatomical inclusions not seen in other dolls. Face is angelic as an infant and overall material used is durable yet soft to the touch– like real human skin. lifelike face making your child feel like a real mommy. At 15-inch, its lifelike size is complemented with an adorable face and mesmerizing blue eyes. Body parts are also movable and so lifelike. A toddler can learn how to dress it up with a pink knitted romper complete with matching cloche hat and booties when going out and about. At night, it can be put to sleep then swaddled with a matching knit blanket. Definitely, this is one nurturing toy every child should have. 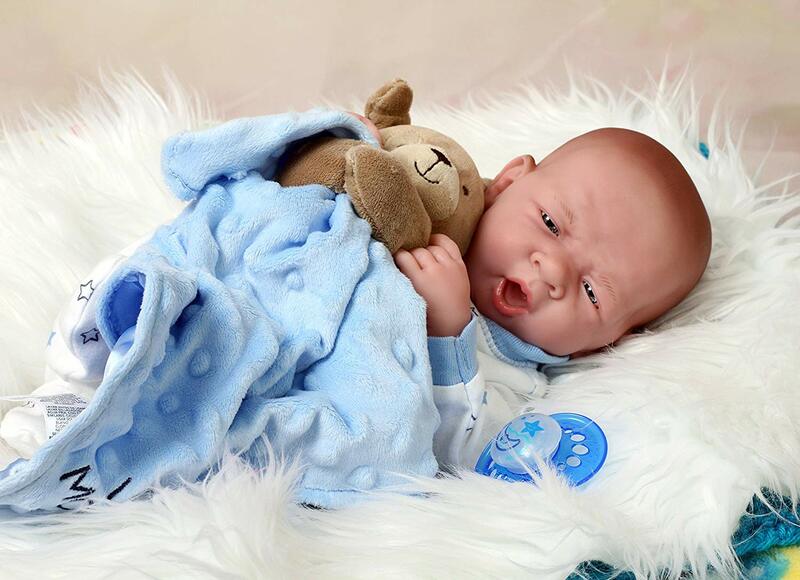 Another exciting realistic lifelike doll to add to your child’s collection is the 14-inch Sweet Baby Boy with pacifier. It’s like a newborn baby boy, with soft vinyl skin that’s painted naturally is so soft and smooth to the touch. Just like what a newborn baby feels like! It’s designed to smell and feel like a baby. 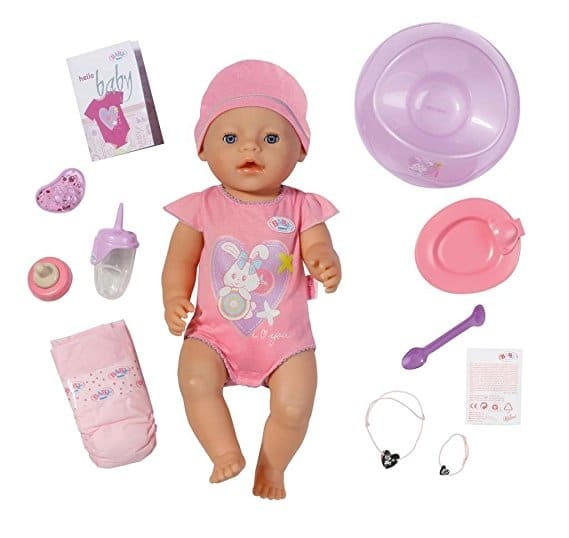 This doll set comes with a feeding bottle, a blanket, a plush neck pillow, a backpack, a belly button band, pacifier with holder, baby socks, 2pcs baby clothes, disposable and cloth diapers, baby plush toy, and a hospital bracelet. You also get to have a birth certificate so your child can name it on their own. 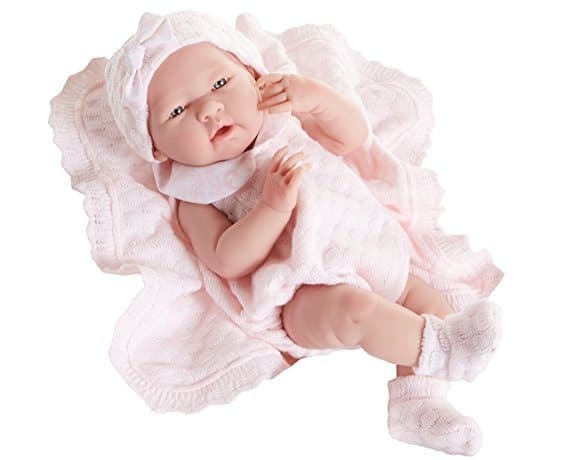 This reborn baby doll not only is lifelike, it breathes! Yes it breathes, coos and has a heartbeat. It comes with hand-rooted hair , in a cuddly clothed body and is weighted to feel like a real baby in your arm. It’s not only a realistic doll but is a collection item also. It can be gifted to adults also like one customer bought it for her mother suffering from dementia. Without a doubt, realistic baby dolls that cry and poop, eats and wets are awesome pretend play sets to give to your child. This allows them to learn compassion and kindness while stimulating sense of nurturing and caring. It also helps to develop various skills from cognitive to vocabulary, fine motor and organization, and self-help. When introduced with proper guidance, you are bound to raise a socially responsible and emotionally mature child even at a young age. Delivering a baby to this world is not for the faint of heart. Apart from the tumultuous nerve-wracking long months of carrying a protruding belly, hours of labor and delivery can definitely sap one’s energy. It is no wonder that many people go through the tradition of handing out pampering gifts for new MOM. Not only to celebrate such a momentous occasion, but more so to simply give her a sense of relaxation from all that efforts. When thinking of giving one to a family member, friend or work colleague, these gift bundles for new Mommies will definitely get your thoughtfulness across. 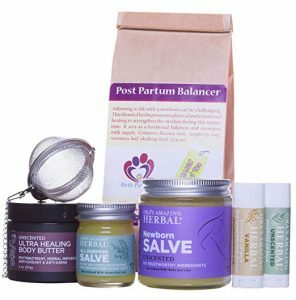 On top of the heaping list is the Ora’s Amazing Herbal New Mama Natural Gift Box. New moms usually have to battle with fatigue and hormonal issues after giving birth. Add to that the stress and efforts required for managing a new baby, and one can imagine how tiring it can be. This makes the organic herbal tea, complemented with a stainless steel infuser, in this gift box a must-have. Aiding in Mom’s recovery, this can help normalize hormone levels while offering soothing relaxation. Salves and balms also come with the package to help take care with scrapes, dryness and unwanted marks. As for the baby, an anti-rash salve also makes a perfect addition, taking one less worry off a new Mom’s list. To send one, you can check out here. Another excellent present to give to a new Mom is this Burt’s Bees Mama Bee Gift Set. It is no secret that a new mother’s skin can look and feel ghastly after giving birth. Apart from dryness and flakiness, the skin have undergone too much stretching causing some damage to the superficial layers. The Belly Butter will help take care of bringing flexibility and suppleness to the stomach’s skin, while the leg and foot cream can soothe the lower limb used to be plagued with edema and such. Beeswax lip balm, on the other hand, can bring back the lip’s lusciousness as this area tend to become so dry after giving birth. Definitely, these products use the gentlest natural ingredients and are meant to soothe and relax a new Mom’s skin and body. To send one directly, you can check out express delivery here. 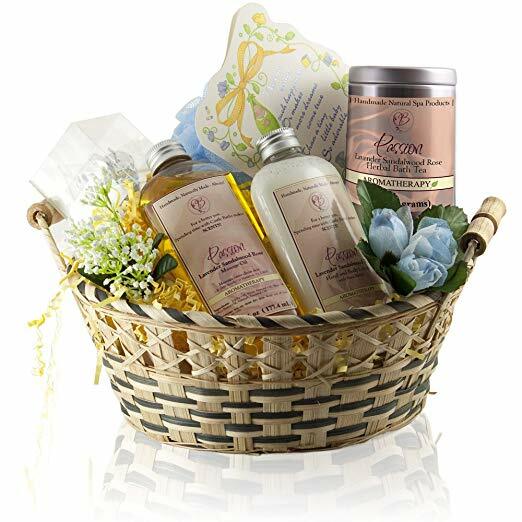 If it’s complete relaxation you wish to give then, the CB New Mom Gift Basket – Home Spa Gift to Pamper is a perfect fit. The gift pack comes with a massage oil, hand and body lotion, and herbal bath tea. Bearing ingredients like lavender, rose and sandalwood essential oil, it aims to replenish the skin’s lost moisture due to hormonal changes during pregnancy and to relax the senses after months of backbreaking efforts. The scent of essential oil extracts offer that distinctive serenity and relaxation that many new Moms want as they settle for the long haul ahead. The pampering pack also comes with a silver scented candle, a loofah and a Mommy card– all packed exquisitely in a decorative basket ready to be given anytime. To order one, click here. These pampering gifts for new mom to enjoy are definitely on point. Delivering not just relaxation and rest, such gifts also help new Moms regain their confidence and vigor as they prepare for a new adventure– Motherhood. With these gifts, you can easily state your thoughtfulness without uttering a word. Send one now! Ever tried opening a safe or a cabinet that takes a hard time to budge? Or ever experienced wondering what goes into your Mom’s locked chest of jewelries? Oh, how you must have loved to feel those shiny brooches and charms! Locks and keys are part and parcel of everyone’s childhood fare. The curiosity and wonder are enough to give a little child wondrous glee of discovery. Thus, it is only fitting to find the best toddler toys with keys and locks to satisfy such thirst for discovery. More than the fun, these toys also help develop a young child’s fine motor skills. When thinking of buying one, these items come highly recommended. One of the topnotch makers of young children’s educational toys, Melissa & Doug continue to be much-revered in the market today. The brand’s style is classic yet effective and have safety as a main priority to ensure that a child learns up to the best of his ability while growing up. 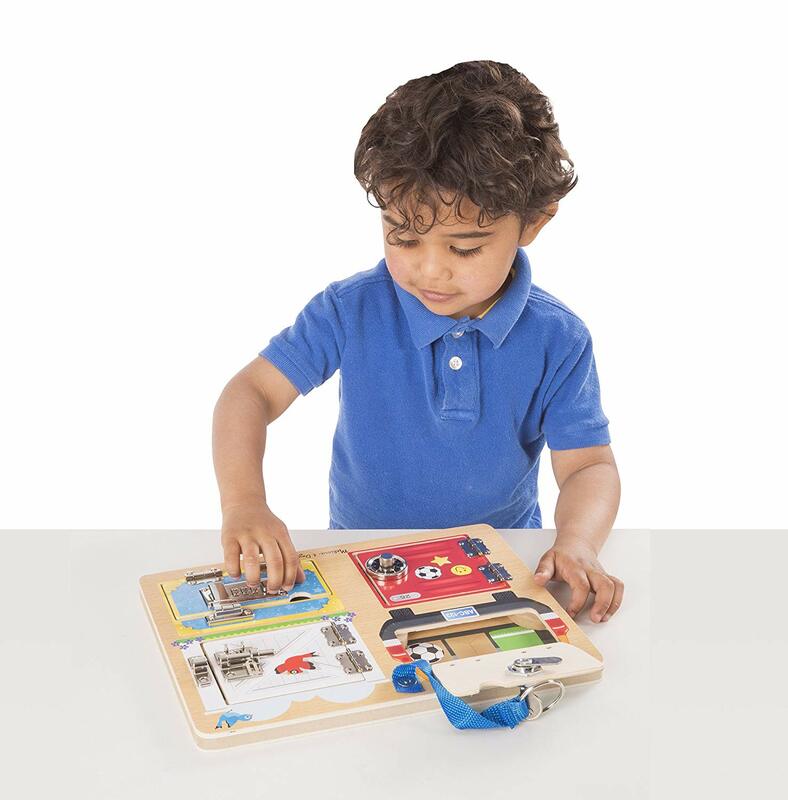 This makes the Locks and Latches Board Wooden Educational Toy then, perfect for developing a child’s sensory-motor skills, hand-eye coordination, problem solving and logical or spatial thinking. With this toy set, a child can unlatch, unlock, and open hinged panels to gawk at the astounding wonders hidden underneath. This also allows them to learn colors, numbers, shapes and the likes. With such intriguing artwork hidden underneath, a child’s curiosity can be heightened allowing him or her to explore more on the senses and discover things with glee. Give your cutiepie’s inquisitive mind a bump to the right direction by getting it from here. What more can be more exciting to play with than a garage full of cars! Such is the delight that the Battat – 3 Car Garage – Shape Sorting Toy Garage bring to toddlers from age 2 and up. Coming with a set of 3 keys, a child can help enhance his/her fine motor skills, hand-eye coordination and logical thinking by opening up each and revealing a car parked inside. 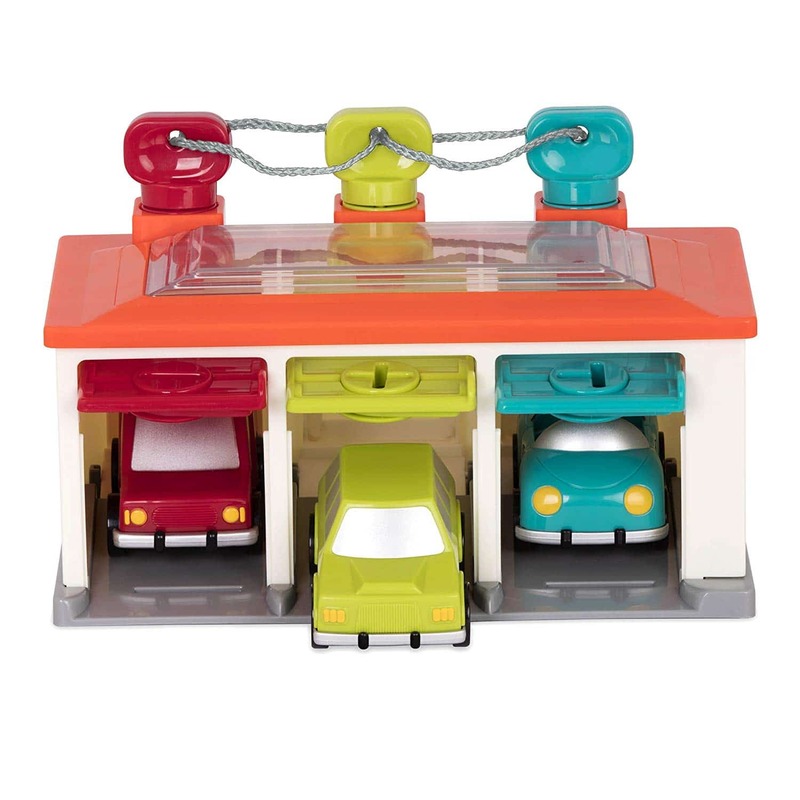 Aside from the multi-colored garaged and keys, the cars inside also come in different colors allowing a child to expound his/her color and number recognition skills. The toy also doubles as a shape sorter and features fun and interactive push-button play to enjoy. Definitely, this is one toy that makes imaginative play more fun and enjoyable! To get one for your own child, click here. Without a doubt, these toddler toys with keys and locks above are awesome finds! Not only are they loads of fun to lock then, open, it can also help enhance a child’s fine motor skills making tasks like writing, tying shoelace, grasping utensils, using scissors, and other key tasks easier to handle. They provide excellent activity for a child to develop dexterity and flexibility of hand use. Most importantly, it allows them to develop logical/spatial thinking and a sense of discipline. Breastfeeding can be a tricky affair if you are outside with your baby. While it is an accepted part of motherhood, and most people will be supportive of you nursing, it is your clothes that can pose a problem. So, to put an end to it, we have brought you 3 beautiful breastfeeding dress options to choose from! When it comes to maternity and post-partum dresses, most women look for comfort. But merely comfort isn’t enough – they also need to be convenient if you are nursing. And of course, many women are particular partial to stylish clothes. And this dress fits perfectly into all these categories! It is a really stylish dress, and one that doesn’t actually even look like a breastfeeding dress. It can go perfectly with some stilettos and some elegant jewelry, and fit in just fine as a regular dress. But the advantage is that the dress has a deep V neckline. This is particularly easy to stretch down for breastfeeding. It is a summer dress, so naturally it is not going to be stifling or hot. The material is also a blend of Elastene (5%) and Viscose (95%). This combination contributes to comfort as well as a very beautiful drape. The elegant Seraphines style knot in the front looks elegant, and also facilitates easy breastfeeding. The gathered style in the front also helps to conceal the post baby bump. In fact, owing to this design element, you can even wear it while you are pregnant! Available in 3 colors: Turquoise, Fuchsia & Navy Blue. The dress is pretty disguising and form flattering – just what a new mom would want post delivery! The fabric is also super comfortable and quite stretchy. This is particularly good for new moms. The dress is also quite easy to care for. To check out all the other helpful tidbits from other new moms, just go check out the reviews. And then if this does fit your budget, go ahead and order it! The high low hemline is pretty in these days – and just because you are a new mom doesn’t mean that you cannot sport it! In fact, this empire line dress with an edgy high low hemline is a great way to nurse easily and also disguise your belly! This dress works pretty well for breastfeeding since the empire line with a gathered look is actually un-stitched. And underneath you have a second bodice, with slits for feeding. When needed, you need to just pull up the empire line and your baby can access your breast. The dress looks pretty elegant, as is evident from the photo. It is actually designed in such a way that it doesn’t look even remotely like a maternity or nursing dress. You can easily dress it up with the right accessories for any special occasion, so that you look great and still nurse your baby when needed. The material here is a blend of Lycra (6%) and rayon (94%) which is also quite comfortable and looks great too. Available in 2 colors: Navy Blue & Purple. The material is actually great and low maintenance. Even if you are traveling, the dress doesn’t wrinkle in your bag! Quite often people won’t even be able to tell that you are wearing a maternity dress – because it looks like a regular dress! The layering on the top for feeding is all but concealed, so again, you can be really discreet. You could always check out the rest of the reviews on Amazon before making a final choice! This also has an empire design, but it is actually quite unlike the last one. That’s because where the last one was elegant, this one is more on the cute and casual side. But then when you are a new mom with baby in tow, you can’t always dress dowdy in the name of casual, can you? So, here is this dress for you. This too has an empire area that is easy to pull aside for comfortable and discreet nursing. In addition to the easy nursing, it also features a skirt gathered in the front. This is perfect for concealing the post partum bump, easily and fashionably! The fabric is very comfortable and actually looks more expensive than it really is! It is actually a blend of Spandex and Viscose. Again, a dress that can easily transform from casual to chic with the right accessories. Available in 3 colors: Orchid, Sangria Red & Black. The dress is very stretchy and the material comfortable – so that new moms can feel comfortable – something that they obviously value a lot at this time. While the bodice does stretch a little after nursing, it shrinks back to the original shape after a wash. The dress easily transforms from a home dress to something you can wear outdoors and you can even continue to wear after you’ve given up frequent nursing. As for more information, check out the Amazon reviews for the details. And once you do, go ahead and order them… The budget shouldn’t limit you with this! So these were our 3 breastfeeding dress options that are all convenient, flattering and comfortable. Also, there is something to fit every budget. You just need to figure out which is the one for you and order it. And once you do, you will be all set to be the stylish new mom!